Our work began early this Memorial Day. Both dad and grandpa (my dad) were outside by 7:30 working on the swing set, the Cedar Summit Panorama from Costco. They braved the 90 degree temps and humidity, and worked tirelessly through lunch. By early afternoon the rest of the barn raising crew came by to help finish things up (and break things in!). By 3:30 p.m. today we were up and running. Miss A was the first down the slide. She popped out at the bottom and yelled, “This is going to be fantastic!” And as for Mr. N, he and his crew were already busy playing spies up in his new hide-out. So now that the work is all done (many thanks to dad and all the other barn raisers! ), it’s time to eat. We made one more old school dish for this weekend, the Pennsylvania Dutch Shoo Fly Cake. 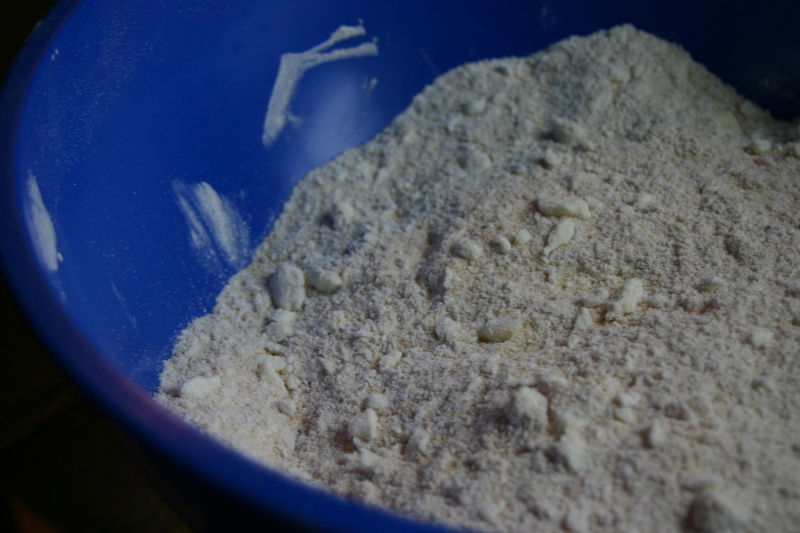 First we cut the butter, brown sugar and flour together reserving about a 1/2 cup for the topping. Then we added molasses and baking soda to boiling water for some fizzy foamy fun. 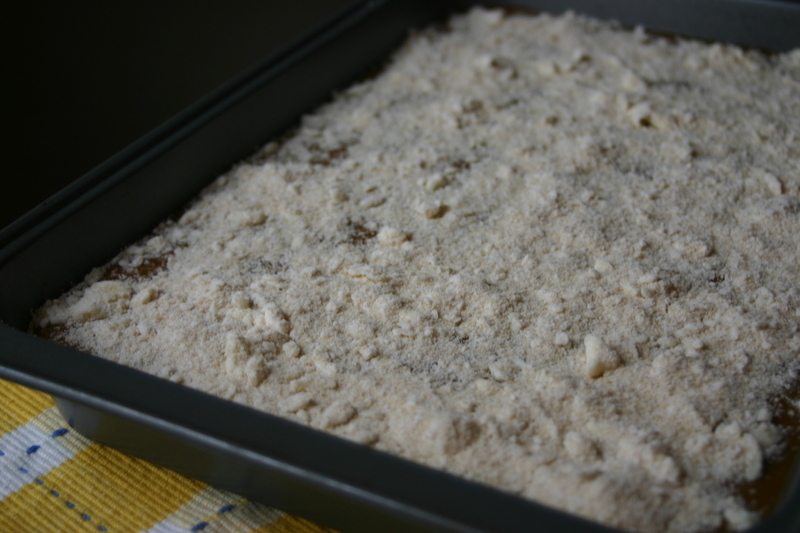 The molasses was then added to the flour mixture to form a batter which was poured into a greased baking dish and topped with the reserved crumble. The cake baked for 45 minutes at 350F. In all honesty, if you like molasses you might enjoy this cake. It tasted mostly like molasses. I did add a bit of ginger and ground cloves to the cake batter, and had I added more I might have liked it a bit better. 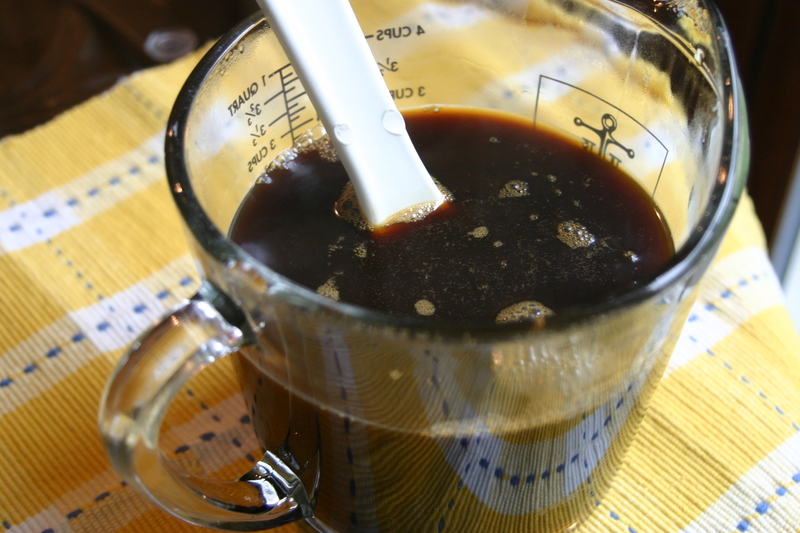 It just needed some more flavor – something to cut the molasses a bit. Oh my goodness! My children would absolutely FLIP for this! I think we need to revisit the outdoor toy equipment situation (I say with two children clinging to me). Outside anyone? LOL! It’s been great and I’m hoping the novelty doesn’t wear off anytime soon. So far all they want to do is be outside. It’s great! Thanks for visiting Kate! The swing set looks awesome, where did you buy it? We got our like 8 years ago at Costco and the kids want a new one, they say it’s boring now. This is cute since it has the little house and all. 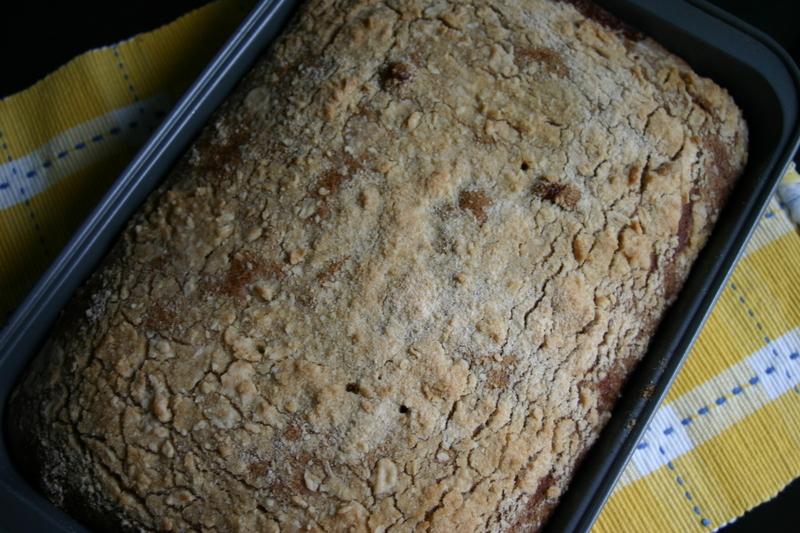 I’m not sure about the cake since I’m not a huge fan of molasses, I wonder how it would taste with honey….too sweet? Looks like you all had a wonderful time. We had that crazy humid 90 degree weather today! We got this one at Costco too. I’m hoping they don’t get bored with it too quickly. My guess is it will occupy them for a few summers anyway. They’ve already been playing spies, bank, hotel, clubhouse…you name it. Well hopefully our nice weather will be headed your way soon. Today is upper 70’s and sunny. Yay! What a lovely way to spend Memorial Day!! The first time I ever tasted Shoo Fly Pie was at a Dutch Country Market in Lancaster. Loved it… your cake sounds so much better. 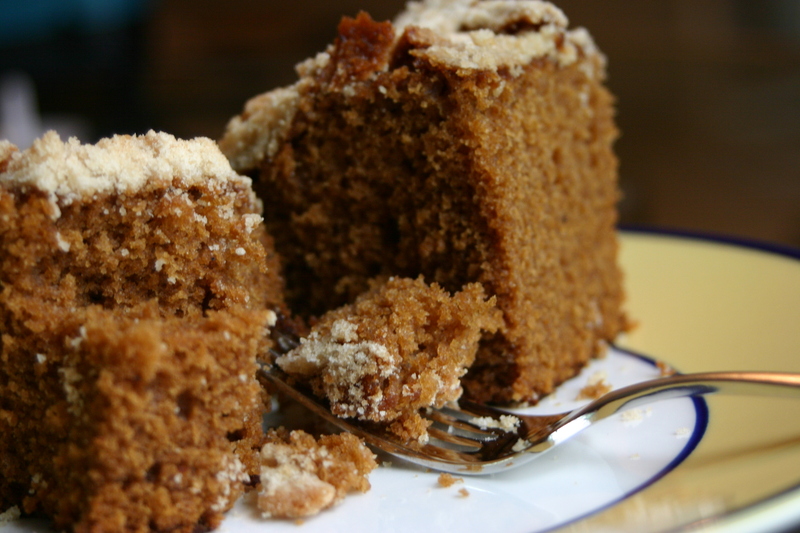 The sound of Molasses and ginger in a soft and moist cake makes my mouth water…Yum!! Wow, what a fantastic looking swing set! I know I would have loved that as a child. Your cake looks delicious as well. I love molasses, but can understand what you mean about its flavor being too strong at times. I included a small amount of molasses in the cupcakes I made a couple of days ago and it was definitely a prominent flavor. Thanks Caroline. Yeah – I think I would enjoy this cake with less molasses. I do have a cookie recipe that uses molasses and I really enjoy those. I think this one just has too much for my liking. And I’m still thinking about that brown butter frosting on our cupcakes too! Yum! Maybe we’ll have to pass through Dutch Country one of these days. It’s funny, we went to the Amana Colonies in Iowa on our way home from the Rockies when I was a kid. The food there is similar to Amish food and I remember being very unhappy with my options. I thought perhaps it was because I was a disgruntled teenager (and a picky eater).But after these few Amish recipes, I have to say, I still have the same opinion as when I was 15. It’s not for me. I’m sure there are probably good Amish recipes out there…maybe we’ll find one another day. LOL. I’m sorry we missed it. We stuck close to the house as someone decided (finally!) that she wanted to start wearing underwear and going on the potty! Maybe Kate can still come over and play on it sometime? Or is she banned for not helping? LOL. You guys are always welcome. Congrats on the potty training! It looks great! I am jealous, I like this one more than ours! Oh your blog is so cute. Your family is just precious. The recipes are great- love the cake. So glad I visited and will definitely be back time and time again! Thank you so much Jessica! Glad you found us and thanks for visiting. Have a great day! Glad you like the recipes. I think I’d love this cake, because I do love molasses. The potato salad was definitely a big seller. 🙂 Thanks! I’ve never heard of “herman cake.” It sounds interesting. LOL – too much of a good thing huh?! I know what you mean about wishing to be young again. That’s one of the best parts about having kids sometimes – you can see the world through their eyes and sometimes even get to play in a kids’ world again. I have a feeling I’m going to be “locked in jail” more than once in this fort. LOL. 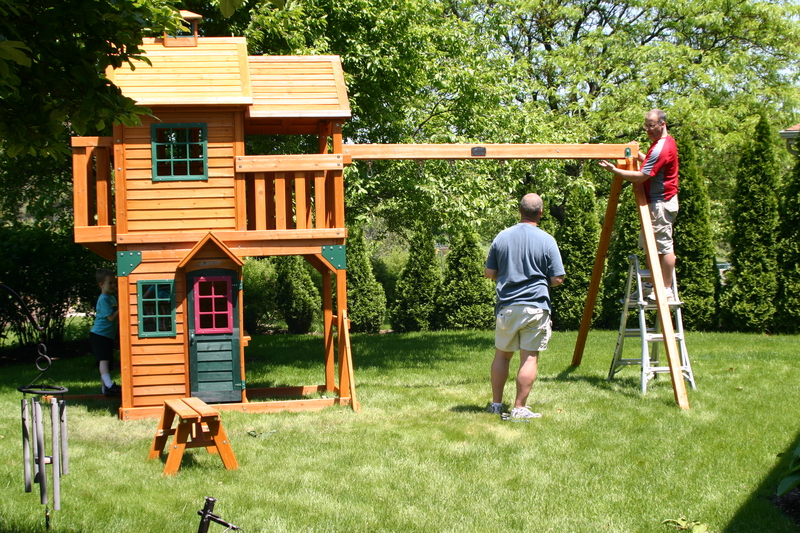 Congrats on doing such a great job with the play fort..
Yay, the swing set / play fort is exquisite! Well done to everybody involved! I do love what Miss A said – “This is going to be fantastic!” What a great day spent together. Oh they had so much fun out there. By the end of the day all of the kids were covered in dirt and soaking wet (from the water gun fights that ensued). They did a good job of breaking things in! 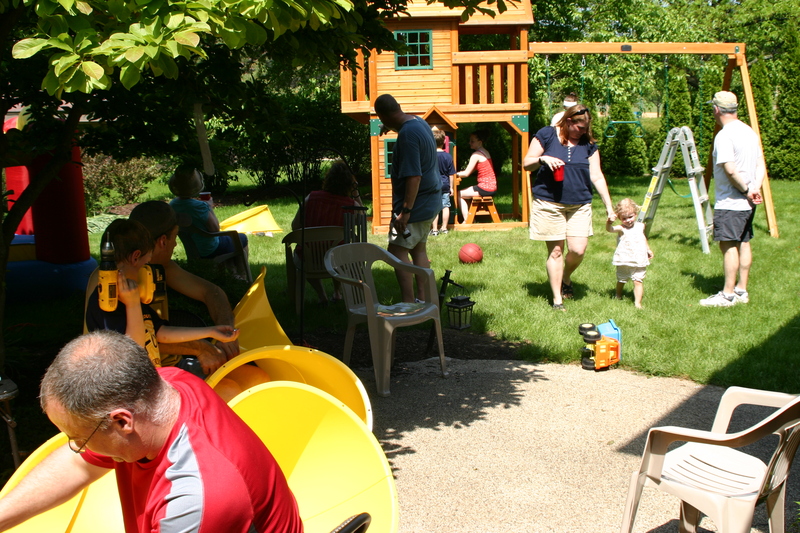 It was a collection of good eats–I spent the weekend putting together a 675-pound behemoth of a play fort in 90-degree heat and still managed to put on a pound or two. Many thanks to all who helped, especially ChefMom’s dad. 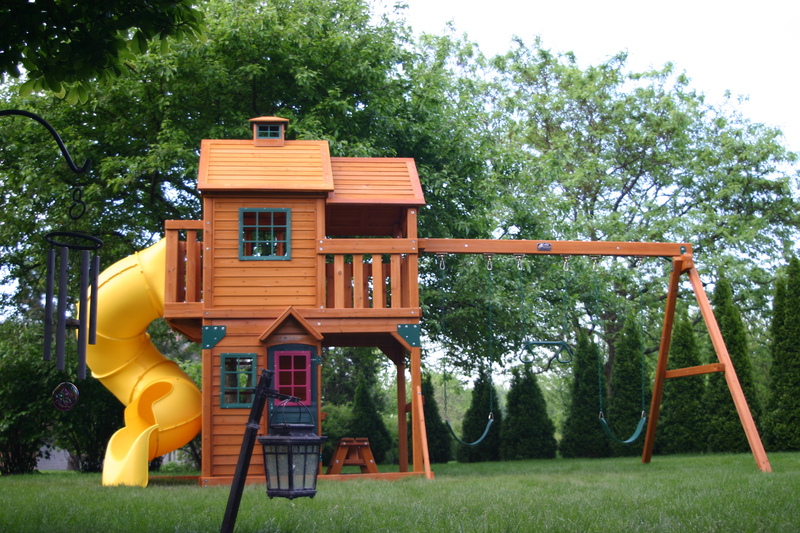 I highly recommend the swingset to anyone in the market–the Cedar Summit Panorama playset. Also don’t forget the brats, courtesy of Ream’s Elburn Market. We had the beer brats, fresh brats, and frank’n’brats. All were very good, the beer brats were exceptional.